Because I can't do just one thing, I actually have three journals on the go this year. "OMG Jenn! How do you even have time for this?! I don't always wash my face before bed, how am I supposed write in three different journals too?! Crazy woman." But wait! Just hear me out. I promise, even if you don't jump into all three like I did, I bet one of these journals will pull at your heart. And I also promise that no matter which one(s) you pick, you will feel good about writing in them each and every day. Disclosure - I won this beautiful gratitude journal from Indigo in December. I've tried gratitude journals in the past because research proves that showing gratitude actually makes us happier people, but I've never been able to make them stick. I've been using this one for nearly a month, and while I don't get to it every single day (I'm probably at about 5 or 6 times a week), thinking of three wonderful things that happened to me or my family is a nice way to end the day. I also have a non-journal version of this that Rob, Sebastian, and I have done for a few years now. At dinner, we almost always make a point to each share our "favourite thing" from the day. And if you have a child who's favourite thing is usually his latest iPad game, we ask for one "favourite thing" that involves a screen and one "favourite thing" that does not. Are you familiar with the Q and A a Day: A 5-Year Journal? How this journal works is that there is a question or prompt assigned to every day of the year. Then, on each page, there is space for 5 answers. The idea is that you jot down one short answer each day and then at the end of the year, you begin again. At a glance, you see how your answers change over the years (or maybe they won't!). At a Penguin Random House event in the fall, one of the women showed me Q and A a Day for moms: A 5-Year Journal and during the holidays I ordered a copy for myself. The cover is gorgeous (because moms are gorgeous creatures, so they should have journals to match), and I am absolutely in love with the prompts inside. Sometimes they're serious. Sometimes they're not. But they're aways meaningful and relatable. 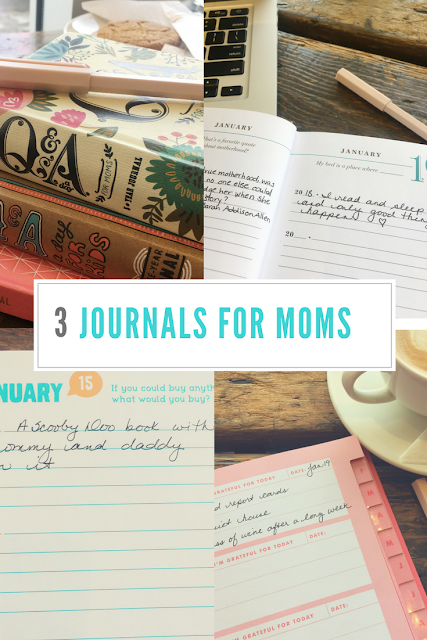 I have been enjoying the 5-Year Journal for moms so much that a few weeks ago I reading more about these books and discovered there is a children's version! Q&A a Day for Kids is a 3-year journal designed in a similar fashion. At the top of each page there is a question or prompt you ask your child, and then there is space for you to fill in their answers for three years. They recommend using this journal with children between the ages of 4 and 9. Sebastian is five and a half, and we have both been already having so much fun filling it out! He looks forward each day to "doing the question" together. I just know this is going to be a special book that Rob and I will treasure for years to come. All in all, it probably takes me about 10 minutes to complete the prompts in all three journals. As I mentioned above, I'm not at 100% as far as daily writing goes, but I'm pretty close, and the Q&A a Day journals are easy to catch up with when necessary. And while the Q & A journals are dated January - December, you can easily jump in at any point of the year. We did a bit of a "catch up blast" on the first day, and went through the first dozen questions or so to get on track (because Seb's mama is too-organized for her own good and starting a year-long journal on January 12th made her twitchy). Which of these journals is your favourite? Do any of them sound like they'd be a good fit for you? My Little Sis Got Married!